When the jacket image for the upcoming James Bond continuation novel Devil May Care, written by Sebastian Faulks, was revealed last week - cover model Tuuli Shipster joined the "Bond Girl" ranks. She began her modelling career at the age of 16 when she joined top modelling agency Storm. The daughter of a diplomat, she is well travelled and has lived all over the world in countries including Russia, India and South Africa. Tuuli studied at Marlborough College and gained 5 A Levels in Russian, Politics, Maths, English, and General Studies. During her gap year she starred in a hugely successful advertising campaign for Pretty Polly which marked the beginning of her modelling career. Campaigns with Arena, Cosmopolitan, Jitrois, Harpers Bazaar, Byblos Blu and a role in Richard Curtis' Love Actually followed. This encouraged her to pursue her fashion career as opposed to a life of academia. It was on a shoot for Elle Macpherson Intimates that she met Rankin and so began a professional partnership on many photographic projects - including a 40 page spread for German publication Quest and a book, Tuulitastic: A Photographic Love Letter - that has spanned three years. 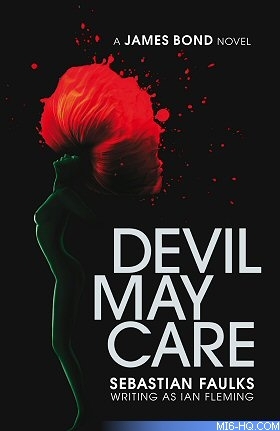 For the cover of Devil May Care, Tuuli stars as the silhouette of a naked woman forming a stem to a blood red flower. The cover photograph was taken by British photographer and commercials director, Kevin Summers. Above: The covert artwork of the first edition hardback, due out May 28th 2008.